If you were to go to the end of the world for that special person, it will have to be Fisterra, literally. Fisterra was believed to be the end of the world and that’s what its name means: land’s end. Beyond this point by the Atlantic Ocean, it was believed there was no more, only otherworldliness. We now know there is life beyond the seas at Cape Fisterra but the ocean views and marvellous sunsets remain as special as ever. A very romantic Camino stop indeed and top of our list! 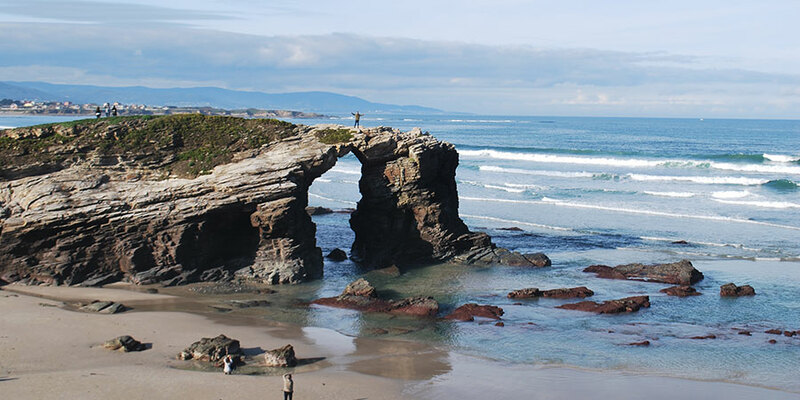 Over the centuries, the sea has sculpted elaborate caves and iconic arches at the Augas Santas Beach just outside the town of Ribadeo in Northern Galicia; for this reason it is now better known as the Cathedrals Beach, Praia das Catedrais. A truly natural work of art, the Cathedrals Beach is not right on the Camino route but it is an absolute must-see if you are walking the Camino del Norte and staying in the town of Ribadeo. The beach is also a popular spot for wedding photographs among local couples so you might encounter a bride or two in all their finery! Considered to be the medieval capital of Portugal, Coimbra on the Camino Portugues is famous for its UNESCO-listed university and its quaint cobbled streets. Coimbra was also where noble Ines de Castro and King Pedro de Portugal lived their forbidden love story against the wills of their powerful families back in the 14th century. Ines would be crowned queen by Pedro after her death. They are Portugal’s Romeo and Juliet and theirs is a tale of undying love. 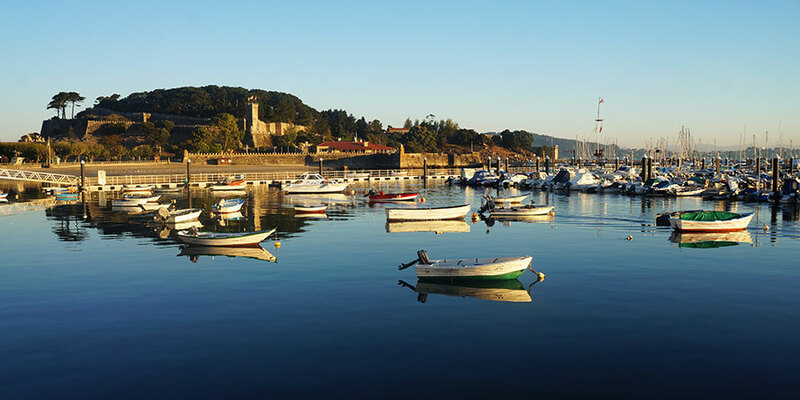 Baiona, along the Portuguese Coastal Camino, is a laid back and elegant seaside town in the South of Galicia. You are in the Rias Baixas region, so you can toast to never ending love with a glass of crisp Albariño white wine and indulge in some of the freshest seafood in Europe. The majestic Monterreal medieval fortress is today a stunning Parador hotel overlooking the bay and the magical Cies Islands in the distance. Just a short boat trip away across the bay, the Cies Islands will feel like you just have reached paradise on earth. Forget Paris, Bordeaux is probably the most romantic place in the whole of France. Known as the Sleeping Beauty, La Belle Bordeaux is a treat for all the senses: explore the Quartier Saint Pierre in the heart of the old city, perfect for a romantic meal or just watch the world go by; admire the city’s impressive architecture from its medieval cathedral to the castle-like gates and mesmerising water mirror; take a boat trip down the Garonne River…. Bordeaux is one of the main stops along the Camino route from Paris and Tours and also home to some of the best red wines in Europe, santé! 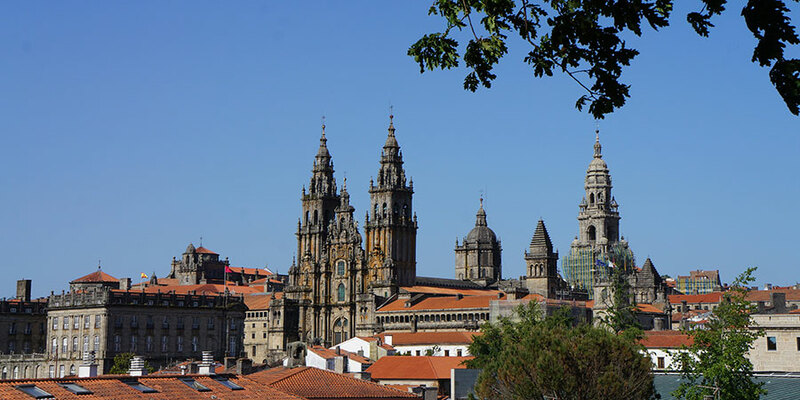 And of course we had to include Santiago de Compostela and its historic old town, inspiration for many Galician poets and writers. Wander its cobbled streets, cosy up in one of the many cafes tucked away in quaint little squares or go for an evening stroll in the Alameda Park, where you should test the acoustic bench, a favourite meeting point for couples since it was built in 1916. We hope you like our romantic Camino suggestions and we’d love to hear about your favourite places!